Published: Aug. 26, 2014 at 09:26 a.m. Updated: Aug. 26, 2014 at 01:09 p.m.
You are 10 rounds deep into your fantasy football draft, and all the names and numbers start to blend together. You know who you are ... the draft gets deeper, and you have no idea who the heck to pick. "Who are these guys?" Well my friends, here are 20 players I like to target when the pickins' get slim at the end of the draft. In 2013, OC Scott Linehan had two running backs rank in the top 17 in fantasy points at the positon in Reggie Bush and Joique Bell. 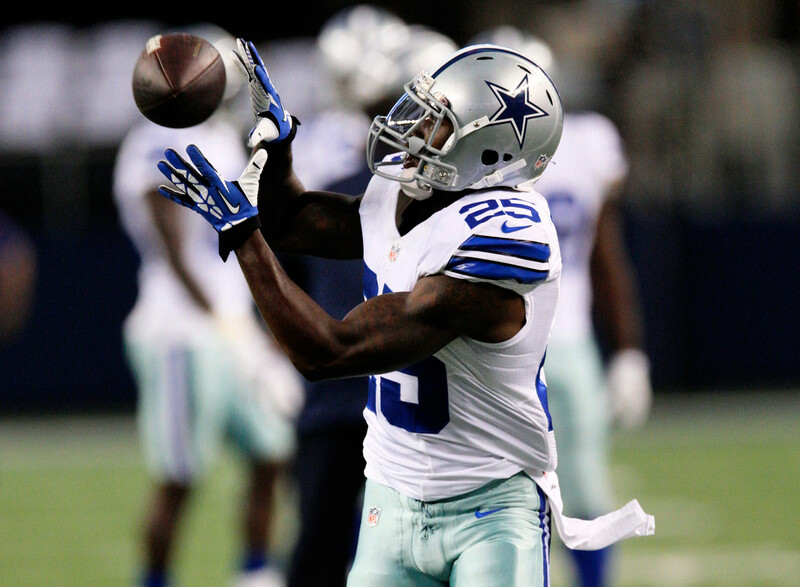 Now in Dallas, his offense is a big reason to like DeMarco Murray ... but don't forget about Dunbar. He's going to see more work this season then ever before and could turn into a nice late-round value. Should Murray ever go down with an injury, Dunbar's stock would soar in fantasyland. Andre Brown is out, Grimes is in as the favorite handcuff for Arian Foster. Coming off back surgery and dealing with a hamstring ailment in camp, Foster is anything but a safe pick in one of the first two rounds of your draft. Enter Grimes, who flashed in the final game of 2013 and would turn into a potential waiver-wire jewel if the injury bug bit Foster for the second straight year. He's worth a late flier in drafts. Matthews has looked good in training camp, and playing in a pass-laden offense under coach Chip Kelly is a major advantage. You also have to worry about the health of Jeremy Maclin, who seems one bad step from getting hurt every time touches the football. In a scenario where Maclin goes down, Matthews could be thrust into an even more prominent role. I'm not expecting a huge season, but the rookie is worth a look. Dobson, who is coming off a foot procedure, appears to be on track to return to action for the Patriots in Week 1. Reports also suggest his locker has been moved next to Tom Brady's ... maybe it's nothing, but it's interesting. With one full season of NFL experience under his belt and what should be a better rapport with the future Hall of Famer, Dobson has some late-round value as a No. 5 fantasy wideout with upside. Antonio Brown can't catch all the footballs in Pittsburgh, though his fantasy owners wouldn't mind such a scenario. Enter Wheaton, a second-year wideout who projects to start opposite Brown when the regular season kicks off. He has raw skills that make him an interesting option, and quarterback Ben Roetlisberger believes Wheaton is "going to surprise a lot of people." Consider him a nice late-round sleeper pick. Stewart has all the talent in the world, but he just can't stay healthy. In fact, he's missed a combined 17 games over the last two years. On the flip side, he is just 27-years-old and is behind a veteran in DeAngelo Williams who is entering his age-31 season. With a few goal-line carries in the team's last preseason contest, Stewart should now be back on your late-round radar as a potential No. 5 runner in drafts. The hype around Michael during the offseason and training camp had been insane, and it has fantasy owners listening. Marshawn Lynch's holdout was only a week, but the heavy workload he has endured over the last three season has his ADP dropping in the late first round. If "Beast Mode" does suffer some sort of long-term ailment during the course of the season, Michael could turn into a massive sleeper across the board. Is the torch being passed in San Diego? Antonio Gates has been the main man for what seems like forever, but it's Green who's earning a lot of praise in training camp. An athletic freak at 6-foot-6 and 240 pounds, Green could end up pushing Gates for targets and depth-chart position. While I wouldn't pick him as a No. 1 in fantasy drafts, taking a shot on Green in the later rounds as a TE2 with upside makes sense. Austin had a lot hype surrounding him as a rookie, but he finished outside of the top 50 in fantasy points among wide receivers and was waiver-wire fodder in most leagues. He should improve in 2014, though, and the trend of second-year receivers posting good numbers makes Austin even more interesting. There are no guarantees here, but Austin's speed and playmaking skills make him worth a late look as a fourth wideout. The Giants will have a different look in their backfield this season, as Rashad Jennings will take over as the lead back. However, Williams has also flashed during preseason and looks poised to open the season second on the depth chart. He already appears to be etching out a nice short-yardage and goal-line role in the offense, which adds to his value as a rookie. Jennings is the man, but Williams is a late target. Every year it seems that we expect Frank Gore to fall off a cliff. And every year, Gore looks Father Time in the face and laughs. But with Kendall Hunter out of the mix, Hyde is now the unquestioned No. 2 runner in the Niners' rotation. The talented rookie out of Ohio State would be a potential fantasy star if this did become the year Gore saw his numbers tumble, making him an attractive late-round flier pick. Steven Jackson has been dealing with a bad hamstring during training camp, and the fact that he's entering his age-31 season doesn't bode well for his chances to return to even RB2 status in fantasy land. Freeman, a rookie out of Florida State, has been turning heads with his speed, elusiveness and playmaking skills on the gridiron. Should the veteran falter, Freeman could supplant Jackson as the top dog in Atlanta. Hunter showed some flashes of serious potential at the end of last season, posting a pair of 100-yard performances down the stretch. While he's not listed as a starter on the Titans' current depth chart, I would not be surprised if he passed veteran Nate Washington and earned a prominent role in the offense sooner than later. Based on his 16th-round price tag, Hunter could be a strong value pick for owners. Ben Tate looks like the favorite to start for the Browns this season, and he's the best bet for fantasy production in the team's backfield. However, West is drawing rave reviews in camp and could etch out a nice role in the offense that's more than just a handcuff. When you also consider Tate's proneness to injuries, it wouldn't be a major surprise to see West start a few games during his rookie NFL campaign. Second-year wide receivers are breaking out more often in the stat sheets. In fact, five posted 1,000-plus yards last season. Enter Hopkins, who had a mediocre rookie campaign but has the talent to make a much bigger impact as an NFL sophomore. When you consider that he's coming off he board at the 13th round on average on NFL.com, you can see the reason I like him as a potential late-round bargain for owners. Ray Rice is expected to get his starting job back once he returns from a two-game suspension, but what if Pierce plays great in his absence? Could we see a committee situation evolve? It's possible. Regardless, owners who draft Pierce late will land a potential flex starter for the first two weeks of the 2014 campaign. That's not bad for a player who isn't being picked until after Round 10 in most leagues.